See you all tonight at the Elihu Harris Auditorium! We are excited to announce that Elihu Harris will be serving as moderator. Please see the below agenda, complete with confirmed attendees. We will be handing out comment cards to attendees on the way in, and volunteers will be on hand to pick up your questions for our candidates. For those who cannot attend, we will be streaming live on our facebook page. See you tonight! There will be a five-minute break between each panel, with the exception of a fifteen-minute break after the District 2 panel. Hear from the City of Oakland Democratic candidates running for Mayor and City Council in the November General election. 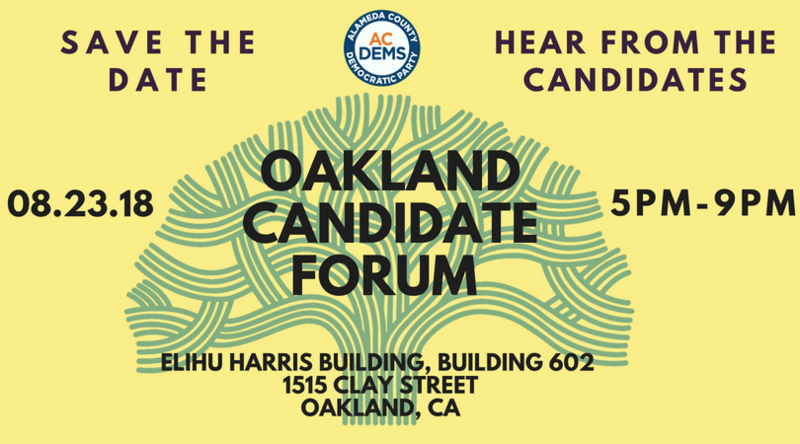 The Alameda County Democratic Party is hosting a Democratic Candidate forum for Oakland Mayoral and City Council Candidates on August 23rd in downtown Oakland. This is one forum you won’t want to miss! This forum will take place before the ACDCC November 2018 endorsement vote. RSVP today at our Facebook event and check there for more information! Paid for by the Alameda County Democratic Central Committee, P.O. Box 3937 Hayward, CA 94540-3937.